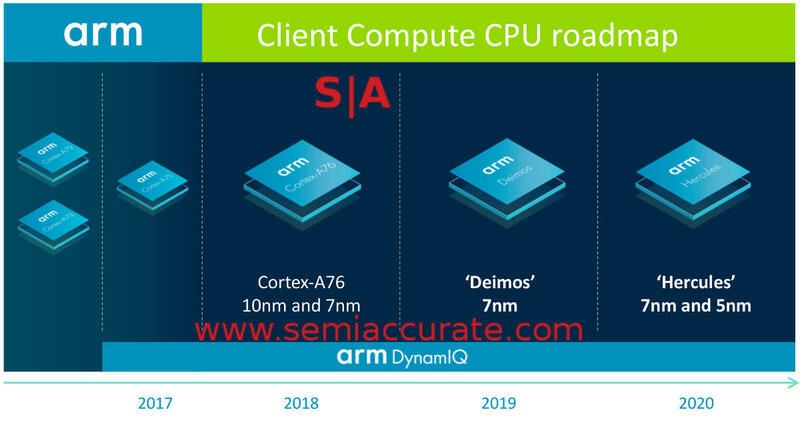 ARM is revealing Deimos and Hercules, two cores they claim will beat Intel in single threaded performance. SemiAccurate thinks the way the claims as stated are a bit overblown but ARM cores already beat Intel in performance per Watt. The two new cores are called Deimos, a 7nm part due next year, and Hercules, a 7 or 5nm device set for 2020. Deimos will go up against Intel’s current Skylake tweaks, Coffee or Whiskey Lake, and should pretty well thrash them. Ice Lake in the closing days of 2019 or more likely 2020 will be up against Hercules. If you recall our server roadmap from last week, you can see the Ice Lake server performance scales up quite a bit from Purley/Cascade. Once you take the number of cores into account, well, core performance doesn’t go up much. Ice cores against Hercules should be a pretty one sided battle, the only unknown is how much Intel’s 10/12nm process climbdown changes the equation. That said, here is how ARM sees the fight. This slide comes with a lot of caveats. First the workload is strictly single threaded but the power is at the SoC level. Intel is at 15W, ARM is at 5W. The Intel machine could run four of those threads, albeit with some loss of peak 1T performance, the ARM SoC could probably do the same as it is an unnamed compute form factor SoC which is unlikely to have less than four big cores. That means it can likely sustain the 5W TDP with ease for extended periods of time and the same holds true for the Intel CPU. Whatever those losses are the 3x energy use delta pretty much hands the win to ARM. The intent of this reveal is to show that ARM is capable of not just beating Intel at their strong suit, single threaded performance, but doing so at significantly lower power levels. This may seem like a stretch but if you look at current ARM architectural license cores like the Apple A11 and the Cavium/Marvell Thunder X2/Vulcan, it is pretty clear that ARM cores can hit pretty high performance levels. More importantly the vanilla ARM cores are designed for a wide frequency range so they leave some performance on the table to gain that flexibility. If you take an ARM core and design it for a small number of workloads and frequency ranges, you can get a lot more performance out of the SoC, and we mean a lot. The classic example of this is the Apple A11 which currently trounces the best Intel has at performance per Watt and in many cases raw performance. The numbers SemiAccurate has seen for the A12 show it gains about 50% more single threaded performance without changing energy use. Some of this is process related but most of it is architectural. You will see in a few weeks and you will be impressed.